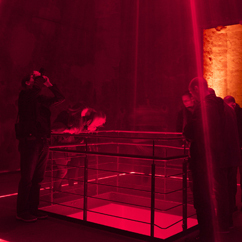 Werk III is a commission of Zollverein, curated by Fabian Lasarzik. Zollverein's "Mischanlage" (mixing facility) is an impressive building consisting of a grid of 3 by 4 funnels, some 20 meters high, built from massive concrete. 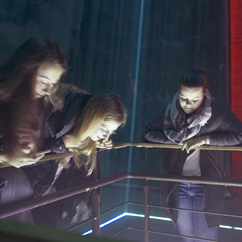 As part of the transformation process from an active production unit to a cultural heritage, some of the funnels have been partially cut through and connected with a walkway, allowing visitors to experience the inside of a structure which usually is not accessible. 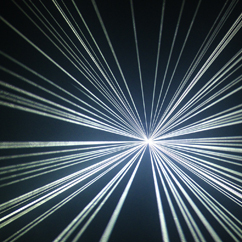 Strong lasers create additional pyramids of light, made visible via fog. 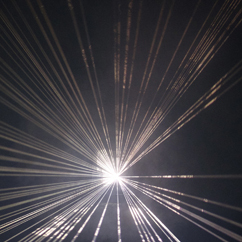 The cold precision of the intensively luminous planes is broken by the unpredictable spatial expansion of the smoke from the fog machines, rigid geometry meets random variation and chaotic behaviour. 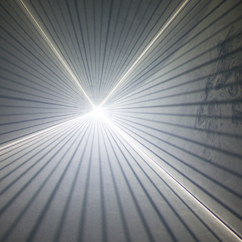 The intensity and texture of the light changes over time, the system oscillates in a very slow multidimensional movement. 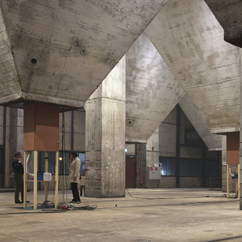 Whilst the lasers in the center of the facility create new visual relationships, big loudspeakers arranged in a remote dark corner provide a complex sonic sculpture, damped by the thick concrete walls. 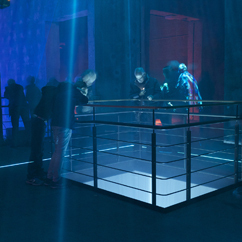 The impact of the sound is dependent on the position of the listener; walking through the installation not only provides different visual perspectives but also varying auditive experiences. 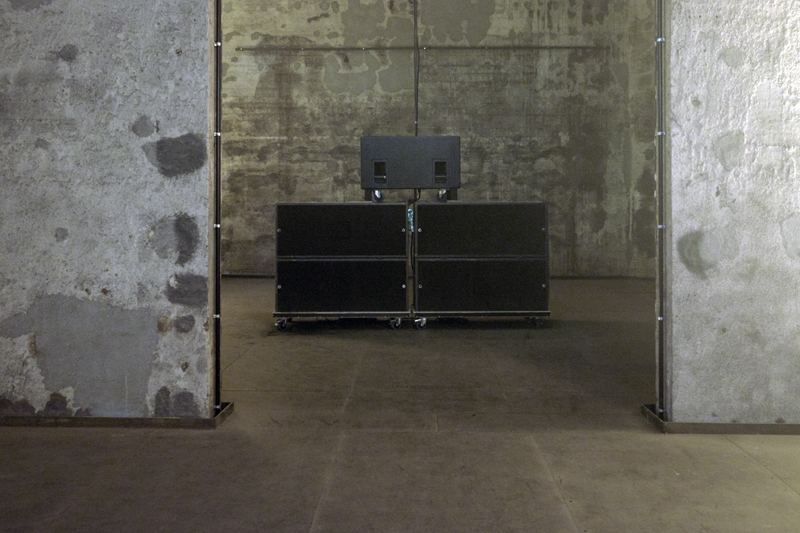 The loudspeakers mainly operate in very low frequency regions, on the edge between sound and vibration. 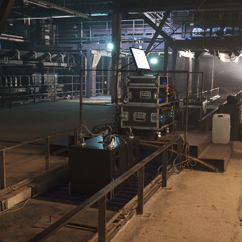 Fog machines are placed at different positions in the building. 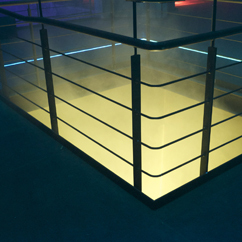 The creation of the fog itself resembles a heavy industrial process; a liquid is heated up and expands at times under high pressure, creating thick white clouds that interfere with the laser light. 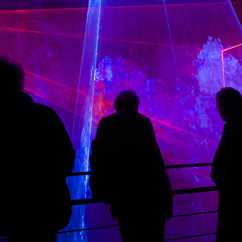 This is not only visually fascinating, but also clearly audible, the expansion of the gas creates a noisy pulse. 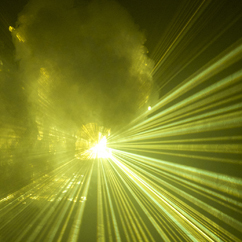 The lasers, the fog machines and the sound interact in a precise choreography, following an algorithmic composition. 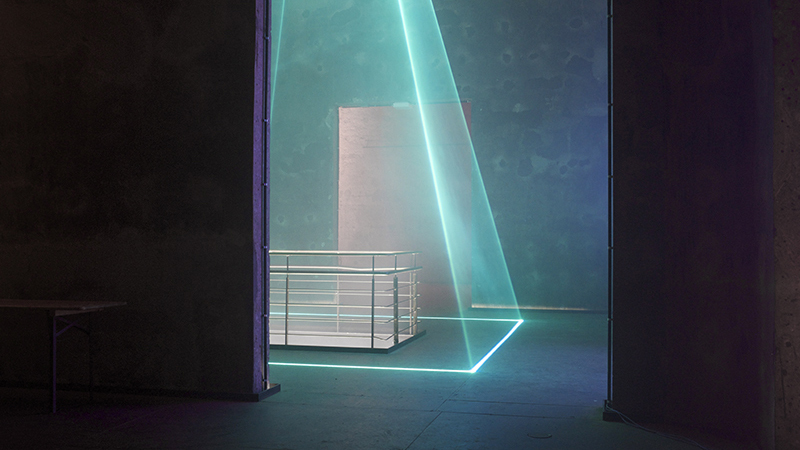 In contrast to a concert, the installation invites to explore the space at individual pace and attention span. 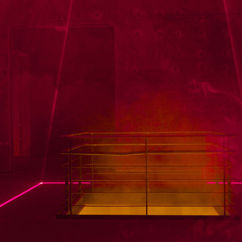 Whilst the concert happens in a space, the installation creates a dialog with it. 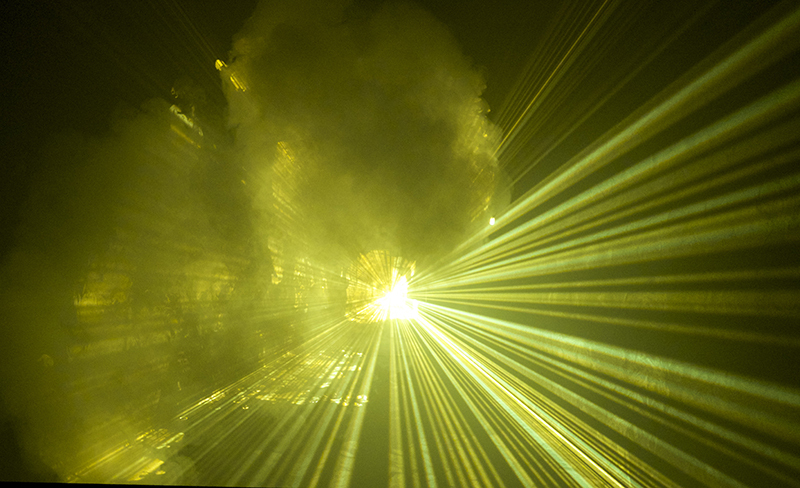 Werk III is a homage to the crude beauty of industrial production, created with nearly invisible matter: light, sound, fog. The german title has two meanings: "Werk" can stand for an industrial production site, but also for an artisitc work. The tradition of enumeration happens in both contexts. ("Schacht VII", "BWV 582 – Passacaglia c-minor" ).